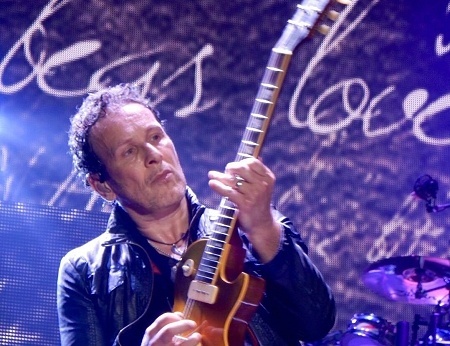 Def Leppard guitarist Vivian Campbell was interviewed by Oklahoma radio in February 2016 and the full audio is available. Vivian spoke to DJs Rick and Brad in February 2016 to promote the Last In Line album. Vivian talked about forming Last In Line in 2011, his time in DIO, the Heavy Crown album, differences between playing in DL/LIL, setlist, postponing their tour and Jimmy Bain's death. Vivian mentioned the differences between playing in Def Leppard compared to Last In Line and what the bands plans were at the time. The interview was conducted before the band got Phil Soussan in on bass and scheduled their first full show after Jimmy Bain's death. The last update on the band from Vivian was in December 2016 when he said they were writing and recording the second album this year. Listen to the full 11 minute interview below. "Playing with Leppard, it exercises a very different muscle. I mean, in Leppard the big challenge is the singing. You know we all sing in each and every song. It's not so much the guitar playing you know. Whereas when I play those songs from the 80s with DIO era works, it's much, much more challenging as a guitar player and in fact I don't sing at all in Last In Line." "Unfortunately Jimmy Bain passed away on January 23rd. A couple of day after we did that one show in Miami. So we felt it would be wrong to just go ahead and do the tour with someone else on bass. So we've shelved that plan but we are gonna do the Rocklahoma festival in May. And we're gonna go to Italy in late April and do the Frontiers Festival there." "So those two shows are the only two shows on our radar for the coming month and we don't yet know who's gonna stand in and play bass. Obviously it's been a very difficult time." "Yeah I agree. I mean we all really, really believe in this record and no one more so than Jimmy. It actually, it really helped Jimmy stay focused in the last year and a half of his life because he finally became sober. Anyone who knows Jimmy knows that he had a history of substance abuse through his life, but he finally turned that page. For the last 18 months Jimmy was absolutely sober and very, very focused on this record." "And I'm glad to say that the quality of the record and the songs that Jimmy wrote with us is, you know, it stands shoulder to shoulder with some of his best work. So he really, really had faith in this record and I know Jimmy would want us to do what we can, and we'll do it. But we gotta do it, you know we gotta balance it and find the respectful way to do it and it wouldn't have been respectful to just get some guy on bass and go on tour right now." "Personally Jimmy's been a friend of mine since 1980 or 1981 when I first met him. Jimmy was the guy who got me my break with Ronnie. He suggested me for an audition with the original DIO band. So I was forever indebted to Jimmy and he was a dear, dear friend of mine and a really sweet man and you know we're doing this for his memory as much as anything else."